Losing hair is among the most distressing of all symptoms I see in my office. It can create an extreme amount of stress and guess what’s bad for hair loss? stress. But that’s just one of the multiple reasons you could be losing your tresses. Most women that are concerned about hair loss are taking biotin, collagen or a host of other hair/skin/nail supplements. Which is fine, most of these nutrients are great for stronger hair and we want any new growth to be strong. But we always have to ask: why is it falling out in the first place? It may not be a biotin deficiency. In fact I’d venture to guess it’s not low biotin at all. Biotin, collagen and other pro-hair nutrients are helpful as they nourish the new hair that grows in but job one is figuring out why it’s falling out and treat that ASAP. So before you spend more hard earned cash on a miracle hair supplement let’s talk about some root causes (wow, bad pun huh??) of your hair loss. Normally we have about 120,000-150,000 strands of hair and shed about 100 hair per day. Usually, at any one time, about 90% of those hairs are in a growing phase, growing by about 1/2 inch each month. This phase lasts for two to three years. When that time is up the hair will go into a resting stage. This “rest” lasts for 3 to 4 months before that hair falls out and is replaced by a new one. When you see more hair in the shower drain, in your hair brush or your ponytail holder goes around an extra time all of a sudden this is typically low thyroid, high stress or low estrogen. It can also be the increased inflammation or oxidative stress or as a result of nutrient deficiencies especially anemias (low iron, B12, etc.). Let’s dig into each of these. Hair follicles are very sensitive to T4 and if you are not converting T4 into T3 effectively you can easily get hair loss. This is essentially overstimulation of the follicle without encouraging actual growth. This is one reason hair loss is such a common side effect of T4 medications like Synthroid. Inflammation can play into thyroid related hair loss as can increased oxidative stress when the cause of the low thyroid is Hashimoto’s or autoimmunity. Immune activation in Hashimoto’s increases both of these additional causes of hair loss. As well it’s not uncommon to have multiple nutrient deficiencies when you have a low thyroid ranging from iron to B12 to a host of minerals including zinc and selenium. Any woman who has been pregnant can attest to the post pregnancy hair shed. That luscious full, thick hair of pregnancy is because you have a lot of estrogen around and this hormone keeps hair in its growth phase longer (or rather delays the end stage of hair’s lifespan) so it doesn’t shed as much. When you are postpartum all that estrogen leaves and you have a massive shed as those hairs that were almost suspended in time start to go through the normal end stage of development, die and fall out. This can be alarming but is very typical and barring no other hormone issues typically regrows without an issue. Keep in mind though that pregnancy can cause anemia, high stress (anyone who has lived with a newborn can attest to this) and can worsen or spur low thyroid issues or trigger Hashimoto’s (autoimmune hypothyroidism) which can all compound hair loss or hinder it’s regrowth. Hair loss due to low estrogen can also happen during menopause and even with low estrogen due to faulty ovulation in women with PCOS. More on PCOS specific hair loss in a bit. The science on how exactly stress causes hair loss isn’t concrete, yet many women report additional hair loss when under stress. What seems to happen is that stress can cause more hairs to go into the resting phase (thus, not growing) and then 3-4 months later they fall out. But when we stop and think about it, it makes sense stress affects hair loss because we know that high stress hormones (cortisol) can quickly cause inflammation, oxidative stress and disruptions in other hormones like progesterone, estrogen and thyroid which will all affect hair loss. And then what’s more stressful than losing your hair? So there’s a bit of a vicious cycle here as well. Think about it this way: if you’re under some type of metabolic stress your body wisely diverts resources It wants to keep you alive and cares less if you have beautiful hair. Annoying? Maybe, but it is also lifesaving. This is the classic male-pattern hair loss that can occur in women with imbalanced hormones. Loss at the front or crown is typically related to problems with estrogen metabolism and excess androgens such as testosterone. Poor estrogen metabolism can occur from bogged down liver biotransformation (AKA detoxification) or from an unhealthy gut bacterial balance. The estrobolome is a subset of gut bacteria that are key for estrogen metabolism. Testosterone whether in excess overall such as in PCOS or when taking testosterone replacement or as a result of unhealthy testosterone metabolism, also common also in PCOS as well as in menopause, can cause this pattern of hair loss. Supporting healthy metabolism of testosterone with nutrients like zinc and herbs such saw palmetto, nettles and pumpkin seed can help as well. I use this product in my practice with great success. 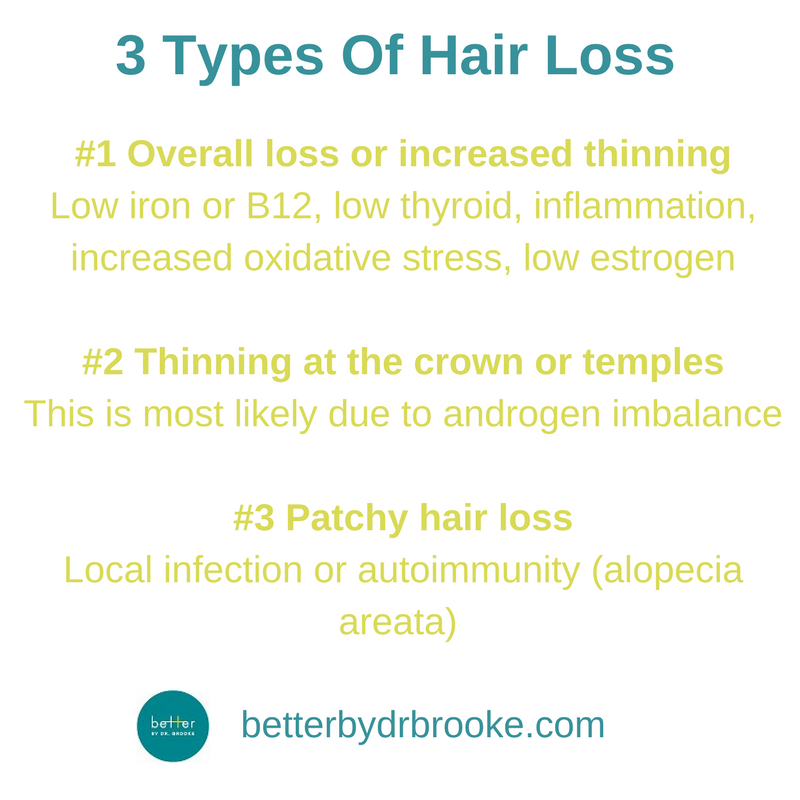 While these factors contribute to hair loss for any woman, it’s particularly dicey for those of us with PCOS because when the follicle is exposed to our elevated androgens such as DHT (di-hydro testosterone, an active metabolite of testosterone) it gets damaged. Whenever a cell is damaged it generates oxidative stress which further alters the androgen receptor in the follicle perpetuating the issue. This oxidative stress gets out of hand especially quickly when we are low on antioxidants such as CoQ10 which is a significant problem when women are taking birth control pills which many women with PCOS are. When a woman is experiencing hair loss and has PCOS, spironolactone is often prescribed and it can be helpful but it’s important as well to address all these other issues when it comes to PCOS related hair loss. It’s also important to know that there is only a mild correlation of elevated testosterone on a blood test and hair loss. This is likely due to the hypersensitivity of the follicle to androgens in PCOS. Basically we get an exaggerated reaction from a smaller amount of testosterone. What about PCOS related hair growth? Those of us with PCOS often deal with hirsutism which is hair growth on the face, arms, lower stomach etc. of coarse, darker hairs. Yet many women with PCOS also suffer with hair loss on their head. Yes I know this may be the most cruel of hormonal fates. DHT activity is increased by insulin so severity of hair growth and hair loss depends on each woman’s hair follicles sensitivity to androgens. There is some genetic variability as well as insulin resistance will varies from woman to woman. The take away? Keep your blood sugar balanced and do everything you can to improve insulin sensitivity. Exercise is crucial as is knowing your unique carb tolerance. This product contains a slew of nutrients to bolster insulin senstivity. Patchy loss, meaning you’re fine in most areas on your head but you’re losing clumps from a specific area. This type of hair loss can indicate a local infection but can also indicate an autoimmune condition called Aloepecia Areata. Because this often is an autoimmune condition addressing inflammation and oxidative stress are important to resolve this difficult condition as well. This can be the most difficult of all hair loss to treat so I recommend getting the help of a knowledgeable practitioner to balance your immune system. If this type of loss can also be due to fungal infections on the scalp and a shampoo with ketoconazole can be helpful. As well consider supporting blood flow and boosting the immune system.